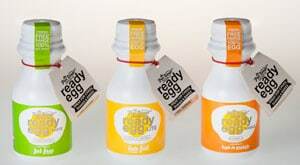 Convenience meets ethics in this first range of pasteurised liquid egg products available to shoppers in South Africa; all Ready Egg products contain nothing but free range eggs. They are preservative and colourant-free, and are conveniently packaged in a recyclable 270ml high-density polyethylene (HDPE) bottles. The free range eggs used by The Free Range Chicken Co are produced exclusively by its sister company, Eikenhof Poultry Farms, just outside Cape Town. Eikenhof has been farming since 1935 and is the first significant commercial egg producer in South Africa to convert 100% to free range egg production. Due to the cutting-edge, second generation wave pasteurization technology used, Ready Egg is preservative-free and must be kept refrigerated: Ready Egg Whole has a shelf life of 15 days, Ready Egg Lite has a shelf life of 19 days and Ready Egg White has a shelf life of 23 days. Once opened, Ready Egg must be used within three days. The technology, Sanovo Wave Technology, is a new liquid egg pasteurization technology producing extended shelf life products while maintaining the functional properties of the egg. Visit www.thefreerangechickenco.com for more information.